Green chemistry brings an attention on a research work emerging from scientific innovations regarding toxic waste acquaintance and it make the use of principles that reduces the use or generation of hazardous materials in an intermediate as well as final steps of Organic synthesis or Chemical progression. Researchers can significantly diminish the hazard to human health as well as environment by following all the valuable philosophy of green chemistry. The most simple way in application of green chemistry in pharmaceuticals is to use efficient, reproducible, eco-friendly, non-hazardous green solvents and green catalysts in synthesis of Organic Moiety, drug intermediates and in researches concerning synthetic chemistry. Organic catalyst brings an exceptional advantage considering the principles of “green chemistry” in Environment as well as economic point of view. Solvents states major serving of the environmental concert of a process and also impact safety and health issues. Water has been found to be very efficient green Solvent and thus can replace many poisonous and harmful solvents. Cycloaddition reactions are fundamental and substantial part of organic chemistry in research. Research work on the aza Diels alder cycloaddition reactions in aqueous systems would be green pathway for organic processes and will definitely protect health as well as environment from toxic materials. In 1987, the United Nations Commission on Environment and Development (Brundtland Commission)  defined “sustainable development”. Key aspects of sustainable development from an energy and chemical view are to develop more renewable forms of energy and to reduce pollution. The contest for the present-day chemical industry is to continue providing applications and socioeconomic benefits in an environmentally friendly manner. Over the last few eras, green chemistry has been recognized as a culture and methodology for achieving sustainable development . Green chemistry is chemistry able to promote innovative technologies that reduce or eliminate the use or generation of environmentally toxic and hazardous substances. Anastas and Warner defined the 12 principles of green chemistry (FIG. 1) inclusive of Atom economic, organo-catalyzed, pollution free, non-hazardous, Energy efficient green chemical processes . 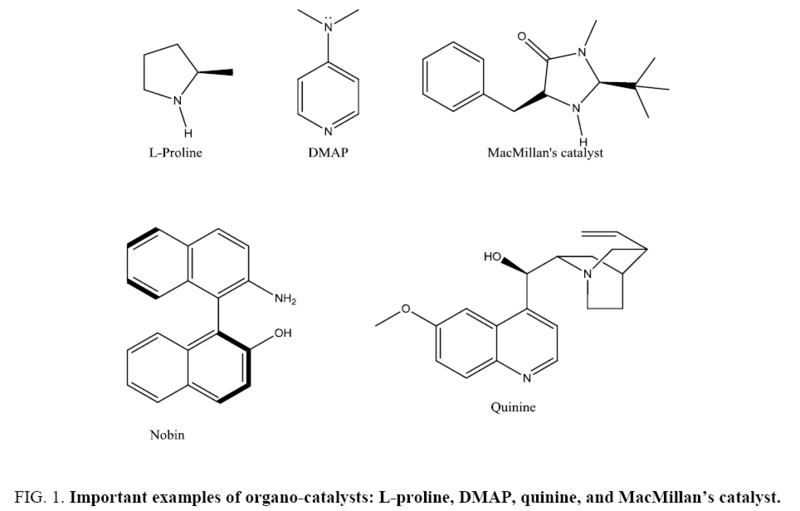 FIG 1: Important examples of organo-catalysts: L-proline, DMAP, quinine, and MacMillan’s catalyst. Catalysis such as enzyme catalysis, heterogeneous catalysis, and particularly organo-catalysis is recognized to be at the heart of green chemistry  because this branch of science is found to reduce the environmental impact of chemical processes.5 The term “organo-catalyst” is a combination of the words “organic” and “catalyst.” The definition links to a low molecular weight organic molecule which in sub-stoichiometric amounts catalyzes a chemical reaction. The organo-catalyst might be achiral or chiral and possibly will be composed of C, H, N, S, and P. Organo-catalysis has found to have several advantages not only because of its synthetic processes but also for the economic point of view. Organo-catalyst does not contain any Metal which brings an incontestable advantage in view of both the principles of green chemistry and the socio-economic point of view (FIG. 1). Organo-catalysis offers many advantages for synthetic organic chemistry. In contrast to many transition metal catalysts, most organo-catalysts are stable to air and water, easily handled experimentally, relatively nontoxic, and readily separated from the crude reaction mixture. Many enantiomerically pure organo-catalysts are readily available from natural sources or easily prepared in a few simple steps, and often both enantiomers are available, providing ready access to both enantiomers of the desired product. Key Advantages of organo-catalysts are as i) Reactions performed by organo-catalysts have potential application in large scale production in industries. (ii) Organic reactions occur which are not in practice and not possible by other forms of catalysts, e.g., asymmetric synthetic processes where organo-catalyst found to have good scope for reaction to occur. (iii) Low cost alkaloids, natural amino acids, L-proline, tartaric acid, and the like are easily available and are economically attractive. (iv) It can be easily recoverable by Recycling process thus immobilization of the catalyst is the simplest way to recover it. (v) There are some organo-catalysts which are bio-derived and biodegradable (vi) It can be work at mild reaction conditions. (vii) In some cases, the final products of reactions may contain high levels of metal contamination derived from catalyst degradation phenomena, which pose a serious drawback if the metal is toxic for pharmaceutical and food industries. Absence of transition-metal brings organo-catalysis at the heart of greening chemistry [5,6]. Solvents outline a major portion of the environmental concert of a chemical process as well as influence safety and health issues. In chemical industry, selection of solvents for synthetic processes and subsequently the waste-solvent management are based on economic, safety and logistical considerations . The pharmaceutical industries have made significant efforts towards identifying non-hazardous organic solvents with a reduced ecological footprint as compared to traditional reactions. Water, liquid polymers, ionic liquids, bio-ethanol, supercritical fluids and ethyl lactate are all green Solvents which have considerable potential . Water can substitute many toxic and hazardous organic solvents and has been found to be very efficient in many organic reactions, out of which some reactions are mentioned in this review. An efficient and handy method for the synthesis of chromeno-isoxazole/isoxazolines under on-water conditions has been described . Hydrolysis of hydrophobic glycidyl ethers in pressurized water media can afford the corresponding glyceryl ethers in good to excellent selectivity within several minutes without a catalyst  Selective and efficient aerobic oxidative iodination of ketones in aqueous media has been achieved by using molecular iodine as the source of iodine atoms, air as the terminal oxidant and sodium nitrite as the catalyst . Many organic reactions are faster and more efficient in water than in organic solvents . In an aqueous medium, non-polar (organic) molecules have a general tendency to form intermolecular aggregates so as to diminish the organic molecule-water interfacial area. This property of water, called the "hydro-phobic effect, "~ brings the non-polar reactants together and consequently rate of reaction increases due to close proximity of the reactants in the transition state. The hydrophobic effect is a principal contributor to acceleration of organic reactions in water. The H-bonding between H  molecule and reagents also plays a significant role in rate enhancement. The H-bonding properties,  high dielectric constant and the complex solvating properties of water make the ionic and asymmetric reaction faster and more selective in water compared to organic solvents . Organic cycloaddition is a very interesting and important chemical reaction due to its role in organic synthesis as well as from academic considerations . In modern organic synthesis, cycloaddition reactions are particularly important tools allowing the generation of at least two new bonds and one cycle in a single step. Additionally, these transformations provide the assembly of complex molecular structures in an easy fashion, with high atom economy and consequently minimization of waste production . The Diels-Alder reaction is widely known as a powerful reaction, especially in its asymmetric variants, for the construction of six membered rings with excellent regio- and stereocontrol . The Hetero-Diels-Alder (HDA) reaction is somewhat less well known but is extremely useful for the construction of heterocycles . The hetero-Diels-Alder reaction represents one of the most important methods in organic synthesis, providing various biologically active compounds. It is a variant of the Diels-Alder reaction where either the diene or the dienophile contains a hetero-atom . The aza-Diels-Alder reaction is one of the most powerful synthetic routes for constructing nitrogen containing six-membered heterocycles . The imino-Diels-Alder reaction provides a useful entry to the preparation of quinolone derivatives. Imines derived from aromatic amines act as heterodienes and undergo imino Diels-Alder reaction with Quinaldehyde . Quinoline and its derivatives are diverse pharmacological agents. They play a vital role in the development of new therapeutic agents. Many new therapeutic agents have been developed by means of quinoline nucleus. Thus, quinoline and its derivatives constitute biologically important class of heterocyclic compounds for the novel drug development. Different synthetic routes have been developed by these researchers for the synthesis of quinoline derivatives. These derivatives have also been evaluated for the relevant biological activity by in vitro as well as in vivo methods. The present review focuses on detailed work done so far on the quinoline and its derivatives synthesized via Organo-catalystic cycloaddition reactions in green solvent system in the search of new therapeutic agents. Quinoline or 1-aza-naphthalene is a weak tertiary base. Quinoline ring has been found to possess antimalarial, anti-bacterial, antifungal, anthelmintic, cardiotonic, anticonvulsant, anti-inflammatory, and analgesic activity. Quinoline not only has a wide range of biological and pharmacological activities but there are several established protocols for the synthesis of this ring  Various new methods have been developed which employed metallic or organo-metellic reagents such as CuCN, LiCl Ruthenium (III) chloride RuCl3.nH2O/3PPh3 Ytterbium (III) triflate Yb(OTf)3, Tungsten vinylidene complex W(CO)5(THF)6, Boron trifluoride etherate BF3.OEt2 Benzotriazoleiminiumsalts etc. for the synthesis of quinoline derivatives . Melting points were recorded on Buchi R-535 apparatus and are uncorrected. IR spectra were recorded on a Perkin Elmer FT-IR 240-c spectrophotometer using KBr Optics. 1H and 13C NMR spectra were recorded on Bruker Avance II 400 NMR spectrometer in CDCl3 using TMS as internal standard. Mass spectra were recorded on a Q-TOF Micromass (ESI-MS), operating at 70 eV. Elemental analysis such as Carbon, Hydrogen, Nitrogen analysis were recorded on a Vario EL analyzer. A mixture of aryl amine (2.50 mmol), Quinaldehyde (2.5 mmol) and L-proline (10 mol%) in water (5 ml) was stirred at room temperature for appropriate time (TABLE 1). After completion of the reaction as indicated by TLC, the reaction mixture was poured in water where there is a formation of product (4a) in a high yield. Filtered it and recrystallized it using ethanol. Purified by column chromatography on silica gel (Merck, 100-200 mesh, using hexane: ethyl acetate 2:8) to afford pure Quinoline in 93% yield (1.18 g). Filtrate containing water was concentrated under reduced pressure to recover the catalyst. TABLE 1. 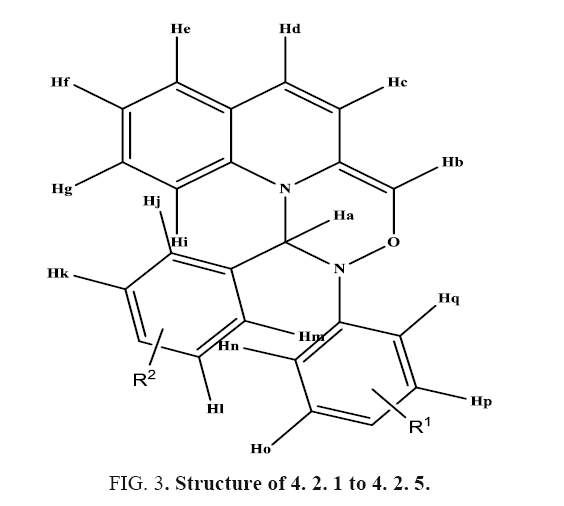 Physical characteristics of substituted substituted 1,2-dihydro-2-(4-phenyl)-1-p-tolyl-[1,2,4] oxadiazino[4,5-a] quinolinegenerated by [4+2] aza Diels Alder cycloaddition of imines and Quinaldehyde. 1,2-dihydro-2-(3,4,5-trimethoxyphenyl)-1-p-fluoro-[1,2,4] oxadiazino [4,5-a] quinoline: Solid, m. pt.=416°C, IR (KBr): 1248-1252, 1350, 1488,1615, 2858, 2889, 2962 cm-1;1H NMR (400MHz, CDCl3/DMSO-d6): δ 3.35(s,9H,CH3), 4.15(s,1H,CH), 4.95(s,1H,CH), 6.21(s,1H,Ph), 7.23(d,1H,Ph,J=8.4Hz), 7.70(dd,1H,Ph), 7.83(d,1H,Ph,J=7.2Hz), 8.48(d,1H,Ph), 8.97(d,1H,Ph,J=5.6Hz), 10.24(dd,1H,Ph),10.93 (d,1H,Ph,J=8Hz); 13CNMR (100 MHz, CDCl3/DMSO-d6): δ 54.94, 55.09, 85.90, 105.04, 113.04, 115.38, 116.03, 116.26, 116.72, 120.92, 122.72, 123.41, 125.55, 126.09, 128.62, 130.85, 132.01, 133.60, 136.70, 142.35, 145.04, 151.40, 161.26; MS: m/z 446.16 (M+); C(70.04%), H(5.30%), F(4.38%), N(6.40%), O(14.40%). 1,2-dihydro-2-(4-methoxyphenyl)-1-p-tolyl-[1,2,4] oxadiazino[4,5-a] quinoline: Solid, m. pt.=382°C; IR (KBr): 1158, 1250,1350,1489, 1617, 2861, 2891, 2965 cm-1; 1H NMR (400MHz, CDCl3/DMSO-d6): δ 2.51(s,3H,CH3), 3.68(s,3H,OCH3), 4.33(s,1H,CH), 4.78(s,1H,CH), 7.12(d,1H,Ph,J=14Hz), 7.18(dd,1H,Ph), 7.31(d,1H,Ph, J=12.4Hz), 7.57(d,1H,Ph,J=3.6Hz), 7.84(d,1H,Ph,J=6Hz), 7.96(dd,1H,Ph), 8.41(d,1H,Ph,J=0.4Hz), 8.72 (d,1H,Ph,J=4Hz); 13CNMR (100 MHz, CDCl3/DMSO- d6): δ 26.02, 55.09, 84.30, 113.54, 114.38, 116.43, 117.26, 118.02, 120.92, 123.72, 123.91, 125.55, 126.09, 128.62, 130.85, 132.01, 133.60, 136.70, 142.35, 145.04, 161.26; MS : m/z 382.17(M+); C, 78.58%; H, 5.89% ; N,7.40% ; O, 8.44% . 1-(4-chlorophenyl)-1,2-dihydro-2-p-tolyl-[1,2,4] oxadiazino[4,5-a] quinoline: Solid, m. pt.=379.15°C, IR (KBr): 775, 1160, 1356, 1487, 1620, 2863, 2890, 2966 cm-1; 1H NMR (400 MHz, CDCl3/DMSO-d6): δ 2.35(s,3H,CH3), 4.3(s,1H,CH), 5.04(s,1H,CH), 6.53(d,1H,Ph), 6.38(d,1H,Ph), 6.93-8.7(m,16H,Ph); 13CNMR (100MHz, CDCl3/DMSO-d6): δ 27.32, 83.30, 113.34, 115.88, 116.53, 117.06, 117.72, 120.92, 123.72, 124.41, 125.55, 126.09, 128.62, 130.85, 132.01, 133.60, 136.70, 142.35, 145.04, 151.40; MS : m/z 386.12(M+); C,74.62%; H, 5.05%; Cl, 9.23%; N,7.33%; O, 4.20%. 4-(1,2-dihydro-2-p-tolyl-[1,2,4]oxadiazino[4,5-a]quinolin-1-yl)-N,N-dimethylbenzenamine: Solid, m. pt.=404°C, IR (KBr) : 1158, 1338, 1359, 1491, 1619, 2866, 2888, 2971 cm-1; 1H NMR (400MHz, CDCl3/DMSO-d6): δ 2.43(s,3H,CH3), 3.28(s,6H,CH3), 4.01(s,1H,CH), 4.38(s,1H,CH), 7.13-8.72(m,16H,Ph); 13CNMR (100 MHz, CDCl3/DMSO-d6): δ 23.62, 42.08, 82.36, 113.34, 114.88, 116.53, 117.06, 118.02, 120.92, 123.92, 124.41, 125.55, 126.99, 128.52, 130.85, 132.01, 133.40, 136.70, 142.35, 145.04, 151.40; MS : m/z 395.20 (M+); C,79.04%; H, 6.44%; N, 10.70%; O, 4.14% . 1,2-dihydro-1,2-dip-tolyl-1,2,4] oxadiazino[4,5-a] quinolone: Solid, m. pt.=360°C, IR (KBr) : 1168, 1356, 1489, 1616, 2861, 2965, 2981 cm-1; 1H NMR (400 MHz, CDCl3/DMSO-d6): δ 2.43(s,6H,CH3), 3.98(s,1H,CH), 4.40(s,1H,CH), 7.19-8.43(m,16H,Ph); 13CNMR (100 MHz, CDCl3/DMSO-d6): δ 25.32, 82.30, 113.34, 115.88, 116.53, 117.06, 117.72, 120.92, 123.72, 124.41, 125.55, 126.09, 128.62, 130.85, 132.01, 133.40, 136.70, 142.35, 145.04, 151.40; MS : m/z 366.17(M+); C, 82.06%; H, 6.17%; N, 7.77% ; O, 4.49%. The focal point of our research was to develop an innovative and general strategy for organo-catalysis that enables simple amino acids to function as organ catalysts for a wide range of transformations that will ultimately provide new chemical tools for the diverse range of biomedical researchers that utilize molecule construction. We further described a catalyst design endeavor that should provide an inexpensive, robust catalyst that provides high levels of asymmetric induction across a broad spectrum of chemical processes. In developing and exploring novel and versatile organo-catalysts we also aim for designing novel green chemical processes by using environmentally benign solvent systems. This Paper presents an array of [4+2] aza Diels Alder cycloaddition reactions between imines and Quinaldehyde catalyzed by L-proline as Organo-catalyst that proceeds with excellent stereochemical control. The catalyst not only activates the nucleophile but also directs the process for cycloaddition leading to a product with high yield. The reaction is simple, reliable, easy to execute and environmentally friendly and benign. L-proline which have several advantages for this conversion which include mild reaction conditions, improved yields, enhanced selectivity, Operational simplicity and work-up conditions. This system does not require anhydrous solvents or hazardous reaction conditions while no particular precautions need to be taken to entrap moisture from the reaction medium. Water has been found very efficient in many organic reactions and can replace many poisonous and hazardous solvents and Water “a green solvent”, seems to be the superior giving best yields. It does not require any hazardous reaction conditions, can work at Room temperature by stirring method, here no or less energy required to proceed reactions. [4+2] Aza Diels alder Cycloaddition reaction of imines with Quinaldehyde catalyzed by L-proline as Organo-catalyst. A mixture of aryl amine (2.5 mmol), Quinaldehyde (2.5 mmol) and L-proline (10 mol%) in water (5 ml) was stirred at room temperature for appropriate time (TABLE 1). After completion of the reaction as indicated by TLC, the reaction mixture was poured in water where there is a formation of product (1a) in a high yield. Filtered it and recrystallized it using ethanol. Purified by column chromatography on silica gel (Merck, 100-200 mesh, using hexane: ethyl acetate 2:8) to afford pure Quinoline in 93% yield (2.28 g). Filtrate containing water was concentrated under reduced pressure to recover the catalyst. IR spectra of compounds 4. 2. 1 to 4. 2. 5 showed peaks at 1350 cm-1 due to –CN function, strong and sharp absorption bands observed at 2861 to 2965 cm-1 due to –CH starching and bands at 1489 cm-1 for CH2 group suggested formation of fourmember cyclic ring structure. Bands at 1489-1594 cm-1 suggested the presence of C=C. In addition, bands were observed at 1091 cm-1 corresponding to the –O-C2H5 group (TABLE 1). The 1H NMR spectra of compounds 4. 2. 1 to 4. 2. 5 displayed signals at δ4.33 and δ 4.78 as a singlet for CH protons. In addition, -CH3 group of compounds (4b-4d) resonated singlet at δ=2.35-2.51 integrated for three protons and compounds 4.2.5 resonated singlets at δ=2.43 integrated for six protons - (OCH3)3 group of compounds 4. 2. 1 resonated singlet at δ=3.35 integrated for nine protons, -N-(CH3)2 group of compounds 4. 2. 4 resonated singlets at δ=3.28. The proton resonance signals shifted to aromatic region at δ=6.21-10.93. Molecular ion peak appears at 234.08 with further fragments at 102.05, 89.04 (FIG. 2). The characteristic 13C NMR peaks obtained at 105.04 to 161.26 for aromatic region, 139 for CH+ group, 84.4 for CN+ group. 13C NMR peaks at values 92.0, 53.3, 39.3 indicate for azetidine group (TABLE 2). In addition, 13C NMR peaks shows at 23.6-27.32 for CH3 + group of compounds, 54.94-55.09 for –OCH3 group of compounds 4. 2. 1 to 4. 2. 2 and 42.08 for –N-(CH3)2 group of compounds 4. 2. 4 (FIG. 3). TABLE 2. Optimized reaction of Imine and Quinaldehyde. FIG 2: L-proline Catalyzed [4+2] aza Diels Alder cycloaddition reaction for the formation of substituted 1,2-dihydro- 2-(4-phenyl)-1-p-tolyl-[1,2,4] oxadiazino[4,5-a]quinoline. FIG 3: Structure of 4. 2. 1 to 4. 2. 5. As a part of our regular approach of fine tuning the amount of catalyst and reaction conditions we optimized the amount of catalyst in the process. Initially 2 mol% (0.05 mmol) of catalyst was loaded to the mixture. No color change observed even after 20 h (FIG. 4). After 20 h color changed from yellow to orange implying the formation of product. The yield was 60% obtained after isolation by column Chromatography. Increasing the amount of catalyst up to 10 mol% (0.10 mmol) resulted in 93% yield at 24 h. The % conversion with time was co-related with time factor (TABLE 3). TABLE 3. Performance of L-proline catalyst at various mole ratio. 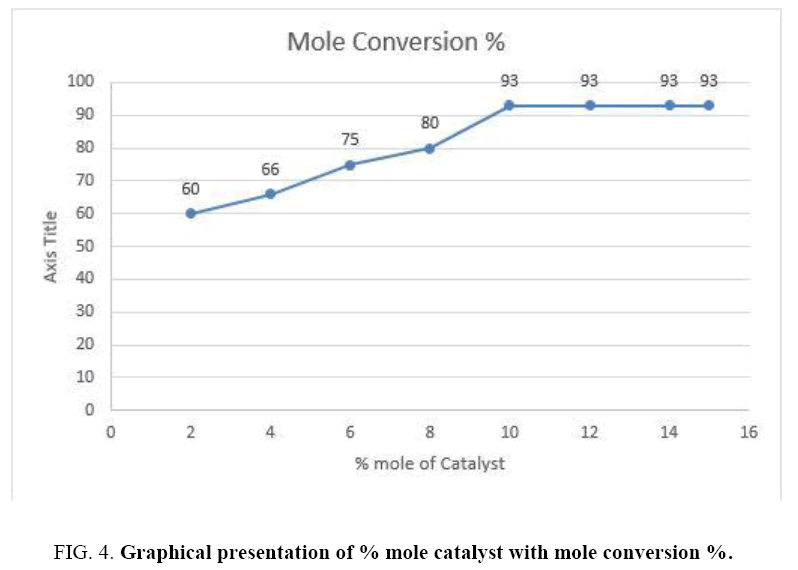 FIG 4: Graphical presentation of % mole catalyst with mole conversion %. In summary, the paper describes an innovative and highly efficient method for the synthesis of Quinoline derivatives from aryl imines and Quinaldehyde using a highly efficient catalytic amount of L-proline. Aza Diels-Alder [4+2] cycloaddition reaction is a widely known as a controlling reaction, especially in its asymmetric variants, for the construction of six membered rings, it has excellent regio- and stereocontrol. The remarkable features of this procedure is mild reaction conditions, improvement in yields, neat reaction outlines, enhanced rate of reaction, greater selectivity and operational simplicity which make it a beneficial and attractive process for the synthesis of six membered heterocyclic motif which have a biological importance. Solvents plays an important role in defining environmental performance of a process, it also influences safety and health issues. Water has been found to be very efficient green solvent and can replace many toxic and harmful solvents in aza Diels alder reaction. These reactions concentrated on applications of organic catalysts in synthesis of fine chemicals and green chemistry. It is emphasized that organo-catalysts are versatile as it catalyzes most of the fundamental reactions in organic chemistry as well as finds applications in commercially efficient processes in chemical industries. In view of global interest in energy efficient and environmentally effective Chemical processes, scientific research on the development of selective, metal free, robust, recyclable, rate enhancing, easy to scale up catalysts and their beneficial preparation methods are thus the need of the minute. Authors wish to express their deep gratitude to Department of Chemistry, Institute of Science, Nagpur, Department of Pharmacy R.T.M. University, Nagpur for FTIR spectral an alysis, SAIF Chandigarh for 1H -NMR, 13C, MASS spectroscopic Analysis. Shaikh IR. Organo-catalysis: Key trends in green synthetic chemistry, challenges, scope towards heterogenization and importance from research and industrial point of view. J Catalysts. 2014;2014. Lancaster M. Green Chemistry: An Introductory Text. The Royal Society of Chem. 2002. Anastas PT, Warner JC. Green Chemistry, Theory and Practice, Oxford University Press, New York, NY, USA. 1998;30. Clark JH. Catalysis for green chemistry. Pure and Applied Chemistry. 2001;73(1):103-11. Clark JH, Rhodes CN. Clean Synthesis Using Porous Inorganic Solid Catalysts, RSC, Clean Technology Monographs, Cambridge, UK. 2000. Shaikh IR. Organo-catalysis: Key trends in green synthetic chemistry, challenges, scope towards heterogenization, and importance from research and industrial point of view. J Catalysts. 2014;35:2014. Seyler CC, Hellweg S, Bruder B et al. Waste-solvent management as an element of green chemistry: A comprehensive study on the Swiss Chemical Industry. Ind Eng Chem Res. 2006;45:7700-09. Walter L. Green solvents-progress in science and application. Green Chem. 2009;11:603. Mustafa JR, Veerababurao K, Chun-Wei K, et al. On-water synthesis of chromeno-isoxazoles mediated by [hydroxy(tosyloxy)iodo] benzene (HTIB). Green Chem. 2010;12:1090-6. Akira S, Takeshi S, Shinichiro T, et al. An efficient synthesis of glyceryl ethers: catalyst-free hydrolysis of glycidyl ethers in water media. Green Chem. 2009;11:753-5. Gaj S, Jernej I, Marko Z, et al. Aerobic oxidative iodination of ketones catalyzed by sodium nitrite on water or in a micelle-based aqueous system. Green Chem. 2009;11:1262-7. Narayan S. Muldoon J, Finn MG, et al. On water: Unique reactivity of organic compounds in aqueous suspension. Chem Int Ed. 2005;44:3275, (b) Li CJ. Organic Chemistry in Water. Chem Rev. 2005;105:3095. (a) Naim B. Hydrophobic Interaction, Plenum Press, New York. 1980; (b) Tanford C. The Hydrophobic Effect. 2nd edn. John Wiley & Sons, Inc, New York. 1980. Aggarwal VK, Dean DK, Mereu A, et al. Rate acceleration of the Baylis-Hillman reaction in polar solvents (water and formamide). Dominant role of hydrogen bonding, not hydrophobic effects, is implicated. The J Org Chem. 2002;67(2):510-4. Lindstrom UM. Stereoselective organic reactions in water. Chem Rev. 2002;102:2751. Padwa A, Pearson WH. Synthetic Applications of 1,3-Dipolar Cycloaddition Chemistry Toward Heterocycles and Natural Products. John Wiley & Sons, Inc., New York. 2002. Fructos MR, Prieto A. [2+2] Cycloaddition reactions promoted by group 11 metal-based catalysts. Tetrahedron. 2016;3(72):355-69. Jørgensen KA. Catalytic asymmetric hetero?Diels-Alder reactions of carbonyl compounds and imines. Angewandte Chemie (International Edition). 2000;39(20):3558-88. Dani shefsky SJ, DeNinno MP. Totally synthetic routes to the higher monosaccharides. Angewandte Chemie (International Edition in English). 1987;26(1):15-23. Brulíková L, Harrison A, Miller MJ, et al. Stereo-and regioselectivity of the hetero-Diels-Alder reaction of nitroso derivatives with conjugated dienes. Beilstein J Org Chem.2016;12:1949-80. Yadav JS, Reddy BV, Rao RS, et al. InCl3-Catalyzed hetero-Diels-Alder reaction: An expeditious synthesis of pyranoquinolines. Tetrahedron. 2002;58(39):7891-6. Yadav JS. In Cl3-catalyzed hetero-Diels-Alder reaction: An expeditious synthesis of pyranoquinolines. Tetrahedron. 2002;58:7891-96. Marella A, Tanwar OP, Saha R, et al. Quinoline: A versatile heterocyclic. Saudi Pharmaceutical J. 2013;21(1):1-2. Anjali A. Quinoline: A Diverse Therapeutic Agent. 2016;7(1):1-13.